The adaptive iridocytes in the skin of the California market squid are able tune color through most of the spectrum. This iridescent skin patch of the California market squid shows its dynamic iridocytes. The dark spots in the background are the pigment filled chromatophores. A close-up view of the iridocytes, showing their potential to tune to a broad range of colors. Perhaps not the brightest of cephalopods, the California market squid (Doryteuthis opalescens) has amazing light-manipulating abilities. While this species shares the gift of camouflage with most other cuttlefish, octopus and squid in the cephalopod family, it is also capable of activating, shuttering and directing its own iridescence in multiple ways. 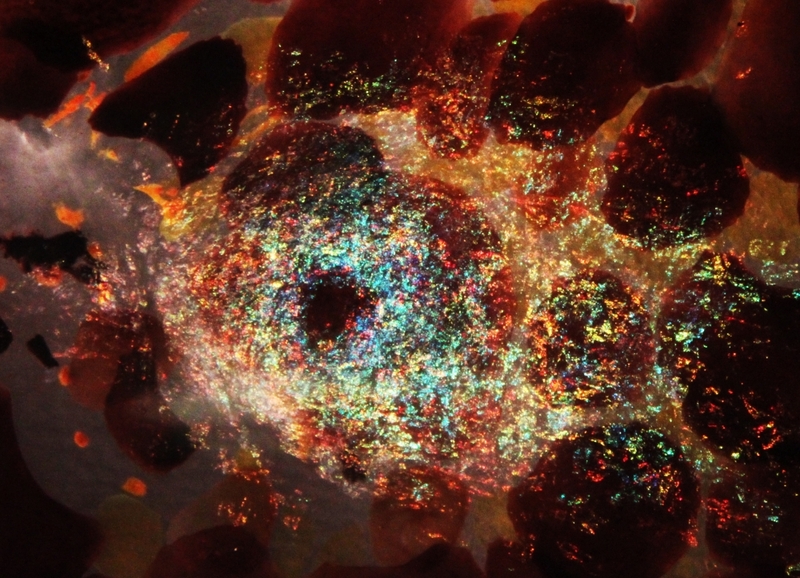 New research conducted in the UC Santa Barbara lab of Daniel Morse, professor emeritus in the Department of Molecular, Cellular and Developmental Biology (MCDB), demonstrates that the squid’s ability to “tune” its colors is correlated with the presence of specific sequences of reflectins, proteins unique to the light-sensing tissue of cephalopods. The findings appear in the Journal of Biological Chemistry. While the diverse optical behaviors of cephalopod tissues have been attributed to reflectins for almost a decade, this work shows for the first time how reflectin protein subtype structure, localization, distribution and relative abundance correlate with the squid’s optical output. Building on the lab’s previous work, the new research details the mechanisms of the animal’s tunable (adaptive) and nontunable (static) iridocytes. 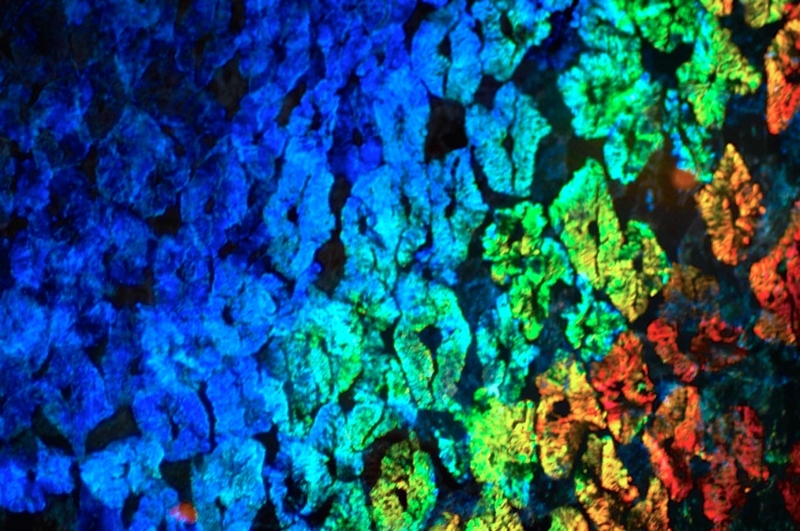 Specialized cells in squid skin, iridocytes — also known as iridophores — produce color via Bragg reflection, by which light is reflected in a very regular and predictable manner. 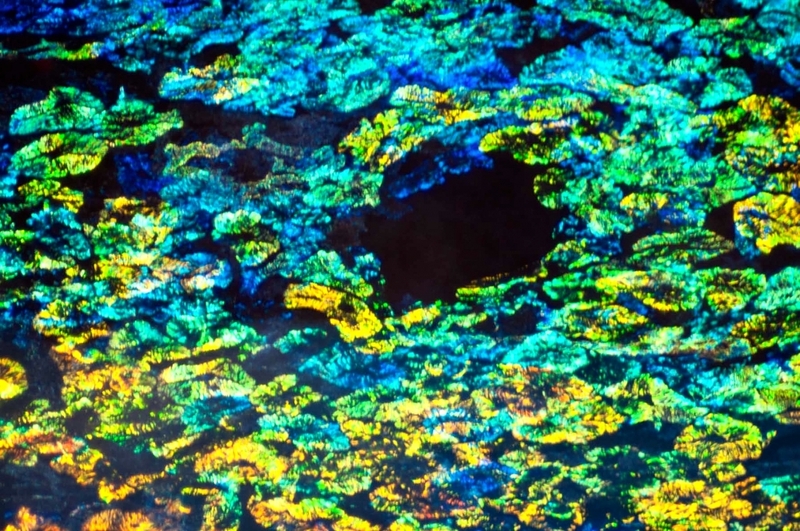 “The discovery reported in this paper reveals the subtlety and power of the reflectin proteins to fine-tune the colors of living cells with a beauty that reminds us of paintings by Monet,” said Morse, who is a co-author on the paper. In previous papers, the researchers demonstrated that the neurotransmitter acetylcholine triggers reflectin proteins to condense and expand deep pleats in the cell membrane through the chemical switch of phosphorylation — a process that turns protein enzymes on and off, altering their function and activity. This in turn tunes the brightness and color of the reflected light so that these layers or lamellae operate as a tunable Bragg reflector. The newly published research characterizes the mechanistic action of iridocytes by characterizing their reflectin proteins. “It’s a very complicated system,” said lead author Daniel DeMartini, who conducted this research as a graduate student and is now a postdoc in another lab at UCSB. The results suggest that distinctive reflectin subtypes have different roles. Reflectin C is found in both static and tunable iridocytes; however, their amount varies. DeMartini noted that because static iridocytes look thicker than the dynamic ones, their potential for increased membrane interface may require larger amounts of reflectin C. Location — responsive iridocytes are located on the squid’s back with more passive ones on its underside — may also be a factor, one that requires further exploration to fully understand. Other members of the UCSB team include Michi Izumi, Aaron T. Weaver and Erica Pandolfi. This work was supported by grants from the Office of Naval Research via a Multidisciplinary University Research Initiative award and the Army Research Office.